This and the remaining two 'Misunderstanding' stories are a series, and about, well, misunderstandings. Since college, I've been something of an adherent of 'General Symantics', the philosophy created by Alfred Korzybski and described in his book 'Science and Sanity'. While his book and General Symantics aren't widely known, I think most everyone knows a saying of his: 'The map is not the territory'. The idea is that language is the map of reality, and an imprecise map at that. Korzybski posits that most all problems in philosophy and logic are, at their base, really problems with language. The 'Misunderstanding' series of stories concerns a cultural liaison assigned to planets with very different cultures than found on Earth, and the problems that can arise due to differences in local customs and imprecise translations of their languages—a very Korzybskian approach, I should think. I'll probably add stories to the series—as long as I can find idioms containing the word 'misunderstanding'. 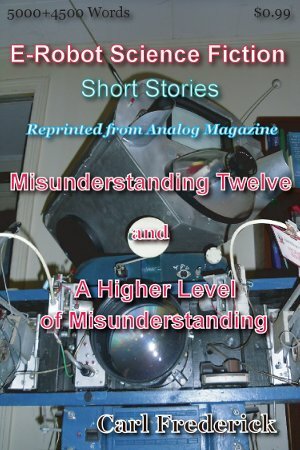 This story, the first of the series, appeared first in the April 2004 issue of Analog Magazine. This story has the same main two characters as the previous story--making 'Misunderstanding' something of a series title. The series considers possible confusions between human and alien cultures, often based on language. Here, the emphasis is on alien cuisine and concepts of courtesy. The story appeared first in the May 2007 issue of Analog Magazine.